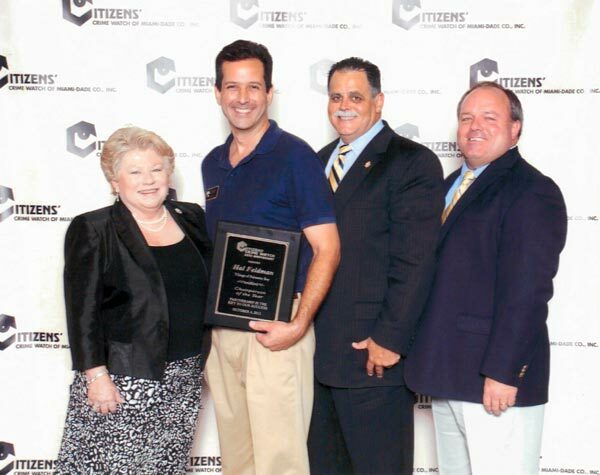 On October 4th, the annual Citizens' Crime Watch Awards Ceremony took place at the Doubletree Airport Convention Center. Over 400 attended. Pinecrest was well-represented with sixth year Police Officer Alexandra Martinez, fourteen-year vet Sergeant Michael Gorsline and Police Chief Samuel Ceballos Jr.
Carmen Caldwell, Executive Director of Citizens' Crime Watch of Miami-Dade County, oversaw the event. "In our 38th year, we're here tonight to celebrate and recognizing those who make a difference. It's our citizens, Crime Watchers and police officers who together fight crime." Caldwell, who has been involved with crime prevention for 30 years and has run CCW for 15, went on to say, "I am very happy and proud to help organize this ceremony because I can personally thank all the people for their help, donations and support." CBS4's Brian Andrews served as MC and was in rare form as he weaved his way through the crowd adding humor throughout the ceremony. He had a particularly good time joking with County and police officials. He and Caldwell also found a fun way of awarding cologne door prizes. Andrews called the scent "The Commissioner" and made several impromptu humorous 'commercials' as they handed them out. Commissioner Lynda Bell played along and made a nice speech midway through the ceremony. During the evening, awards were handed out to those individuals who were most helpful to CCW during the past year. The Citizens' Crime Watch school winners were: Student of the Year Saniorah Edouard, Principal of the Year Dr. Marta M. Mejia and Resource Officer of the Year Darryl Dunn. The Citizens Involvement of the Year award went to Melanie Samuelson. Crime Watcher of the Year went to Ralph Balkin. Police Officer of the Year went to two winners: Ralph Pagan from Miami-Dade and Nick Wollschlager from Village of Biscayne Park. Chairperson of the Year was awarded to the citizen who ran their Neighborhood Watch group. For Miami-Dade, the winner was Adrian Lorenzo and for municipality the winner tuned out to be...me! Yes, this is the first time I get to report on myself! I am pictured here with Palmetto Bay Mayor Shelley Stanczyk, Major Commander Greg Truitt and Officer Peter Judge. Overall, the event sheds light on how citizens and police form a partnership that enhances crime prevention. 2012 saw continued decline in crime statistics. Citizens' Crime Watch of Miami-Dade County credits the partnership with their involvment. In related crime prevention news, next month Palmetto Bay will accept the award for Dade/Broward Crime Prevention Unit of the Year. They are also being honored as the 2013 Police Unit of the Year for all of Florida.